One hot summer day I was eating ice cream after an intense match of tennis. I was sitting on my porch when it appeared, a blue and green spinning portal about the size of a man. Before I could run it sucked me in so powerfully that I got knocked out. When I woke up I immediately saw that I was in Greece. I looked up. There was the Parthenon. Then I realized that there was a tour guide right in front of me. She was wondering if I wanted to learn some facts about the Parthenon. I said yes, and she began. Then the portal reappeared and sucked me back in, then dropped me right on my porch again. I just sat there, thinking about the experience when my mom called me in for lunch. One night I was in the bed asleep and I was having this very awkward dream. This strange man came up to me and asked if I wanted to visit a historical place called Delphi. And I know you’re not suppose to talk to strangers but, I said yes. It was probably the wrong thing to do but, I made it home safely and it was super fun but, please don’t tell my parents until I’m 50. I learned a lot when I was gone. Did you know that part what made Delphi was that Zeus released two birds to find the center of the world then they met Delphi. I also learned the name of the strange man that brought me here his name is Okeninda. Okeninda led me to see many cool things. One of the coolest things I learned was that Delphi derives from the word “dolphin” as it was believed that Apollo arrived near Delphi on a dolphin’s back. Also people in Delphi strongly believed in their gods. 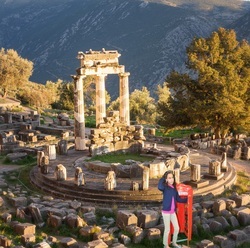 It was really fun learning all these cool facts did you know that Delphi was one of Greece’s most sacred cities and that Socrates one of the philosophers spoke about know thyself. When the day was done I realized that I was not dreaming. I started to freak out I had no idea how I was getting home. Okeninda told me to calm down I tried but I just couldn’t. Finally after a few minutes later I fell asleep. An hour later I woke up and I was at home in my bed. I started to write in my diary about the trip I wrote a lot but then I had to hide my diary so no one could read it. I had an awesome trip I hope I can do it again one day. One day I was vacationing in Greece when I decided to go for a swim. The water was warm and I was seeing how far out I could swim when suddenly I was sucked into a whirlpool. I was scared and wondered where it would take me. When I came up, everything seemed normal, until I realized I was wearing a toga. I was surprised and said “whoa, what happened to my old clothes?” I looked around and did not see anyone on the beach or any boats in the harbor. I looked toward shore and realized that the Parthenon that I had visited the day before was not yet built. After I climbed up on the shore, I went down to the agora to ask someone what was going on. When I got to the agora everybody was bowing to a statue of Zeus. 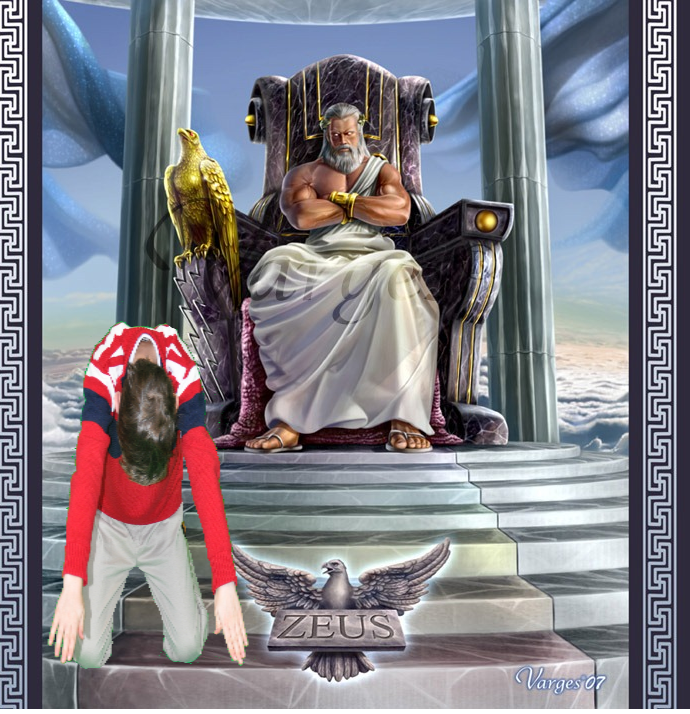 Everyone yelled at me and said “bow to the master”! I quickly bowed to the statue because I was afraid they would hurt me. After we were done worshiping I decided to find Pericles so he could help me get home. After searching for hours, I found him having a debate with the leaders of the surrounding city-states on whether or not Athens should go to war with Sparta. I told him how I got there and that I was from the future, but he did not believe me. He said “There is no way that happened.” I showed him my watch that was ticking backward trying to go back in time. I said “let’s make a deal”. I will help you with your decision, and then you can help me get back to my real time. He said “You’ve got yourself a deal.” I told him Athens and their surrounding city-states should combine to make one large army that would defeat Sparta. This win would give him control over the entire known world. Pericles thought my plan was the best that he had ever heard and that it was fool proof. I said “Now you help me”. He introduced me to Hermes, the God of travel. Hermes placed his golden winged shoes on my feet and suddenly I was spinning and flying so fast I got dizzy and blacked out. The next thing I knew I woke up on the beach next to my family. My dad said “Connor, you have been asleep for hours”. One day I was petting my dog. Then he opened his mouth as wide as he could and sucked me in like a vacuum. And the next thing I know I’m in the city of Troy. It was so beautiful. Immediately I picked up a brochure and read Troy is now modern day Turkey. And is most famous because of the Trojan War. Even though the Trojan War wasn’t held in Troy. The Trojan horse was a gift but also a trap from the Greeks. The Greek armies were hiding in the Trojan horse just waiting to attack at night. Alexander the Great visited the city in 334BC and made the warriors champions. 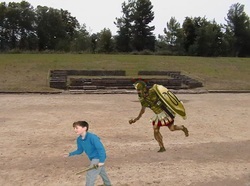 The Trojans were controlled by the Romans. They do not know if the Trojan War was held in Troy. But they are guessing it was there. I have an idea to get home so I can tell my family all about it. I was going to go to a hotel and get in to my pajamas that I bought at a market in troy, then I was going to fall asleep in a bed and dream of home. Well I guess I didn’t dream hard enough because I landed in the the middle of the Trojan War. Ahhhhhhhhh. So come down to Grymes Memorial school to learn about all the Greek cities. One nice spring day I was looking at a pretty purple flower when all of a sudden, it sucked me in. I was a little dizzy for a second, but when I opened my eyes… I was in a Greek theatre wearing a toga! The theatre was big and smelled like great smelling perfume mixed with a slight touch of cement from the construction. It was huge and built on a tall hill with stairs that stretched up the sides. In the middle was a circle where the actors would act and behind that was a two story building that looked like it was used for nothing. But it probably wouldn’t be there for no reason, so I asked this tall Greek lady what it was used for. She said it was called a scanner and was used for special effects and back drops. She was very talkative and after a while it got annoying. But then, finally she told me to go to the very top and listen closely. I sat down and she called up, “get ready” so I listened closely and waited. She dropped a small gold coin in the middle of the theatre and I heard it from the very top. That’s 1,400 seats up. My jaw dropped and I ran to the bottom and I became the talkative one. I asked questions like, how do you get the sound to work? How is it possible? And all sorts of questions like that. She told me that they use a resonator and the sound echo’s off the sides. Later that day I decided to get a tour of the theatre. The tour met at a coffee shop and then we got on a bus to the, what’s it called again? Oh yeah the amphitheatre. 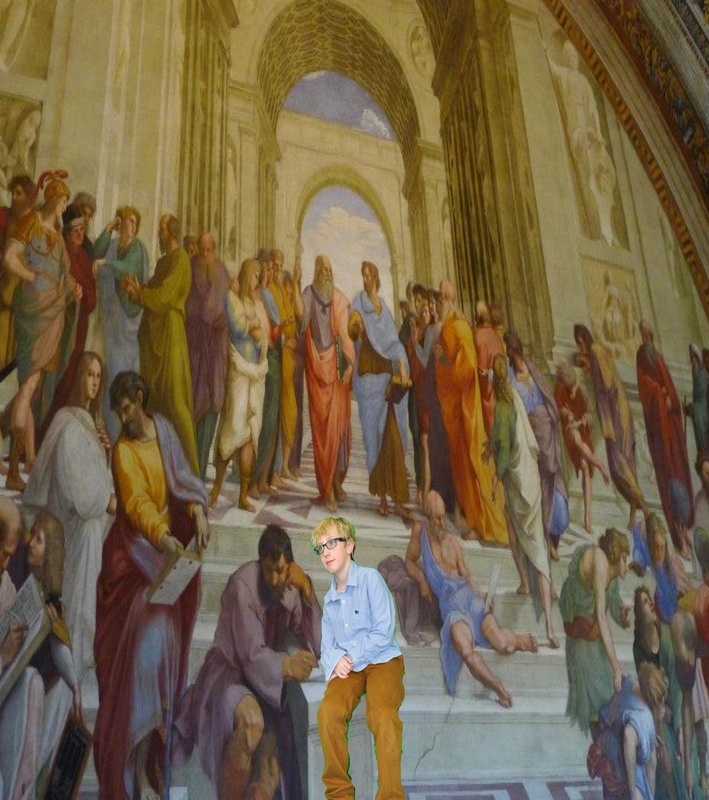 The tour guide started out with a boring lecture about rules and a small amount of interesting facts. 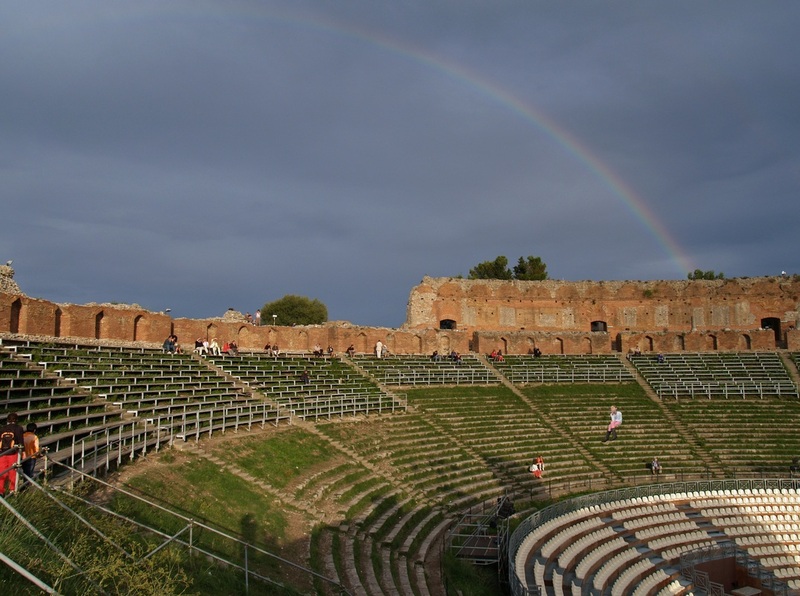 The cool facts he did say is that the theatre has dazzled audiences for 2,500 years. It was built with 55 rows of seats and limestone blocks to honor the gods. What I found most interesting is that we were only 100 miles from Athens. I figured I would go there if it was that close, but I didn’t. Finally we started the tour. We went all over the theatre and even pretended to be actors. That was my favorite part. When the tour was over the tour guide reminded us all to come back for the play tonight, a comedy starting at 6:00 o’clock. I wasn’t going to miss that, comedies are my favorite. When the play was getting ready to start, I got there early so I could get a good seat. I got a seat at the very top and I was the very first one there. I waited about ten minutes and the play started. Before it started the play writer gave a quick speech saying, “I worked so hard on this play and my actors did to. We have been looking forward to this for a long time and finally this is it. This theatre you are in right now was built in the 3rd century B.C.. Enjoy” Everyone gave a loud applause and then the play started. I have never laughed harder in my whole life. I could hear it well, it was funny, entertaining, great, I loved it! After it was over I just had to meet the actors. They were all funny themselves and very nice. They weren’t snobs at all and I think they liked me. That night when I went to sleep I made plans for the next day before bed. I was so excited. But when I woke up, I was in my bed and that wasn’t what I expected. So I thought to myself, yes, I wish I was still there but I’m happy here to. At least I get to go tell my family! My trip to a Greek theatre. Woohoo! It was a hot sunny day, and I was playing soccer during recess. I was diving for the ball when Connor kicked it and it slammed into my head. I blacked out, and I heard voices saying, “Judson, are you ok? Wake up! Wake up!” It was all kind of hazy and muffled. Then, the voices turned into screams and the clank of swords! 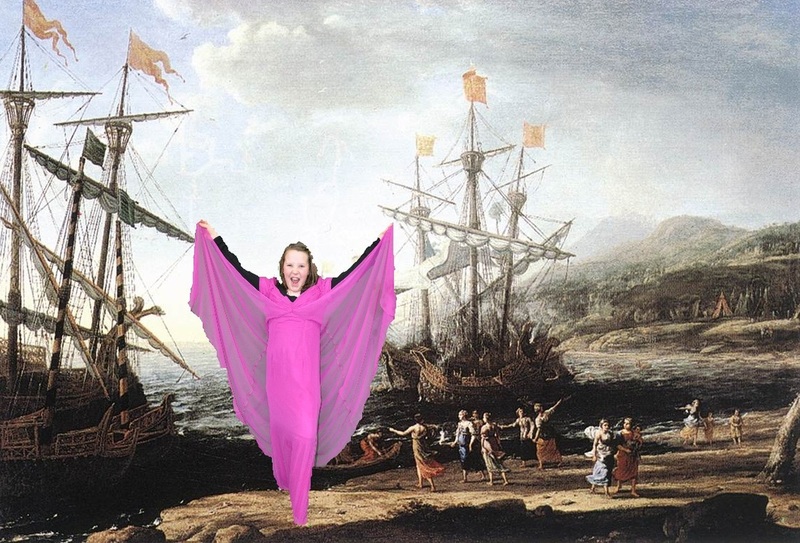 I was in the Trojan War! When I saw all the people fighting and yelling, I sprinted and crouched behind a rock. I started to freak out. I didn’t know what to do. Suddenly, I spotted a peasant hiding behind a huge tree. I army-crawled over to him so no one would see me. I asked him what he was doing. He said, “I am doing the same as you….. hiding!! !” He told me the soldiers were fighting to win Helen back from Paris. I thought all of this is a lot of commotion and effort for a girl, but I didn’t say it. I knew the real Trojan War had lasted for 10 years, so I asked the peasant how long had these soldiers been fight. He answered, “ for 9 years.” I immediately thought about the Trojan horse! I hid for another 6 days. I forced myself to eat grass and raw deer meat in order to survive. On the seventh day, I saw Greek soldiers sailing out of the harbor. I left my hiding spot, in search of the Trojan horse. I found it by the Trojan wall. I had to figure out a way to get inside the gigantic wooden horse! There was a bunch of people lined up to get in the horse. I sneaked up behind a soldier and quietly choked him to death. I stole his armor, disguising myself as a soldier and got in line with everyone else. Within minutes, I was inside the Trojan horse! I was hoping that when I jumped into the horse, I would be transported back home. My next plan was to get in Troy. Once I got inside the horse, everyone just waited. After waiting for a couple of hours, we started to move. No one said a word. It took awhile until we stopped moving. When we stopped, I heard music and a bunch of people singing. The Trojans thought the gigantic wooden horse was a gift from the gods. Everyone celebrated and danced all night. Finally, everything was quiet. We hid in the horse a little longer for ‘safe-measure’. I was surprised that I hadn’t yet been caught. I didn’t understand anything they were saying. My plan was just to stay inside the horse until after the battle. Suddenly, someone yelled and order and everyone, including me, charged out of the horse. I was scared to death, so I hid behind the huge back leg of the horse. Luckily, no one noticed. I watched Troy burn to ashes. At last, Troy surrendered. Greece won! To my dismay, the Trojan horse was set on fire and I was caught in the flames! Just when I was about to die a burning death, I opened my eyes and was lying on the ground in Orange, VA. I heard people around me asking if I was ok. I immediately stumbled to my feet and assured them that I was fine. I never shared my story with any of my friends because I knew no one would believe it. That’s my story on how I survived the Trojan War. It was just a normal day when the whole event happened. It was a hot June day and my mother was away on a business trip, and it was my job to feed pumpkin, Goldie and Miss Selene. They are our barn cats. I walked into the house to get the cat food and then called for the cats to come eat their dinner. Pumpkin was the first to arrive. The others hung back as if something was wrong. I put my hand down to pet Pumpkin as he started to eat from the bowl, and all of a sudden the bowl sucked us in!! 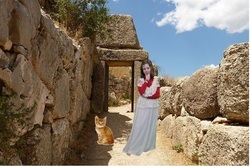 Before we knew it we were in Mycenae! I was not in my normal clothes anymore. My clothes had changed into a long, white, Greek dress. Pumpkin’s little blue collar had vanished. Standing still would do no good so I scooped up Pumpkin and walked toward a little village. At the time it was the most important Greek city and it was very busy, Peddlers, gossipers, farmers, and many other people jostled past us as we walked by. They started to stare at us as they passed. We were clearly strangers. I accidently loosened my grip on Pumpkin and he sped towards the open door of a small house. I ran after him shouting his name. People looked at me as if I were crazy, they have never heard of a Pumpkin. As I came closer to the house, I heard purring. Entering the house left me speechless. Pumpkin was drinking a bowl of milk while being petted by the famous Greek poet, Homer! The start of the Iliad and the Odyssey lay beside him. I was star struck. After a long conversation and apology, I picked up Pumpkin and headed for the door. I had not gotten far when I got the scare of my life. A bunch of soldiers running towards us. Apparently strangers were not welcome! I dropped Pumpkin and we both ran fast! The soldiers had been ordered any strangers in case they were spies. They had been given the order by King Agamemnon. He was a very powerful and famous king. Pumpkin ran as fast as his little kitten legs could carry him. We soon reached a huge wall. 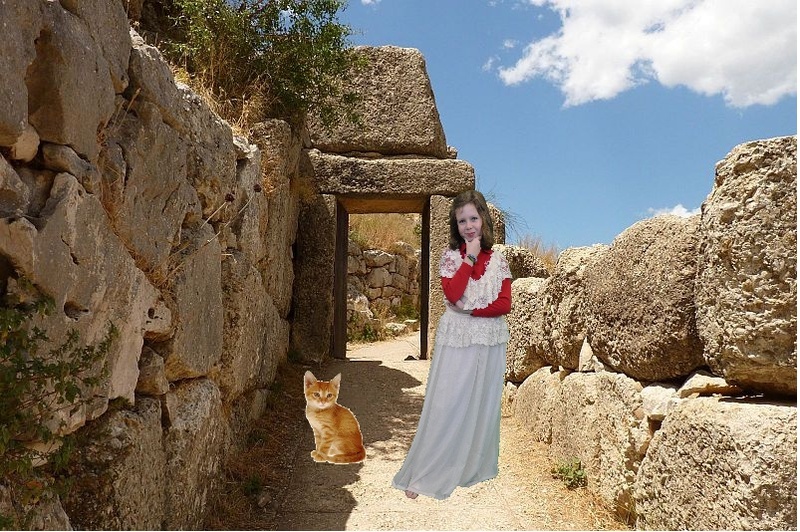 Mycenae had walls that were eighteen meters tall and six to eight meters thick! Suddenly I saw a dark passage leading under the wall. Pumpkin and I hurried down the passage and came up on the other side of the wall. We came up on a graveyard! In the distance we saw a temple. Anywhere was better than a deserted graveyard. It took us about an hour to reach the temple. Pumpkin was panting and I was sweating. The sun was blaring and we needed to get to shade. We both climbed into the temple. I spied something that made me want to jump for joy. A sparkling purple wormhole was in the temple wall. It was going to take us home! I scooped up Pumpkin and jumped through the wormhole and we were home. I never pet the cats again when I feed them. It was a very boring Monday and I was far from excited. “What! Extra history homework! Ugh!,” I exclaimed as my fifth grade homeroom teacher was writing on the board. After hearing what I had said, the rest of the class groaned. Then the bell rang. Everyone rushed to get his or her books, backpacks, and lunchboxes. “Don't forget the extra history homework I assigned you,” Mrs. Wagner called as my fifth grade class rushed out of the room to get on the buses. I went down the hall to go to the carpool room. When I got there, I saw that my friend, Natasha, was there waiting for her mother too. “Natasha,” I called to her. “Did you hear about the extra history homework?” “Yeah,” she said. “Stinks, huh?” “Yup,” I said in return. Then I heard Mrs. Berry call my name. “Bye, Natasha!” I called over my shoulder. When I got home, I got a quick snack then got right to my homework because I had a lot. I started rummaging through my backpack deciding what homework to do when I saw my rotten history book. “Oh well,” I said talking to myself. “ I might as well get it over with.” As I lifted my history book, a piece of paper fell on the floor. My puppy, Charlie, sniffed it. “Hey,” I said. “Get off of that. That's mine.” He looked up at me with innocent eyes as I took the paper out of his jaws. “What's this?” I said as I looked at the folded piece of paper that appeared to be a card. On the cover it said in big print letters 'You're Invited'- like some sort of invitation. As I opened the card to see what was inside, a bright light shined in my face and it felt like I was being sucked into another world..because that was what was happening.....sort of. I awakened by cold, wet, doggie kisses and opened my eyes. There was Charlie looking as cute as a puppy could be. Then, I sat up looking at my surroundings. It appeared that I was in some ancient land because things did not look modern. Nothing like anything that was in the USA. That was because I was on a pillar. I was standing on top of a real live pillar! ( If you do not believe me, look at the picture.) 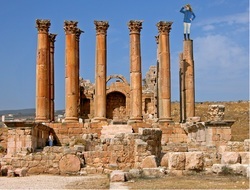 When I was trying to figure out how to get down, Charlie ..well.. fell off the column. But luckily, some random dude caught him. No actually, Charlie fell on the random dude's head. The dude wasn't too happy about it either because he screamed and ran away. I called to my puppy and he looked up wagging his tail joyfully. Then all of a sudden he talked. “Hi, Lily!” he said still wagging his tail. “You can talk?” I asked him. “Now I can,” he said. “I know how you can get down from there. I have a friend that's a harpy eagle and she can get you down.” “Get her now,” I demanded desperate to get down. “She should be here soon,” he said. “I told her to meet me here at 4:00. It's four now.” As soon as he said that, a giant eagle swooped down, picked me up, and set me on the ground and then flew away. “I know you know I know all the answers to all your questions, but there is no time to explain. We have to rebuild the Temple of Artemis, or the Temple of Diana,” my puppy said. “Where's that?” I asked. “Right here,” he replied in his puppy voice. “Oh,” I said confused. “But, it doesn't look like a temple anymore!” “That's because it got burned down and we were summoned here to rebuild it,” he said. “Summoned by whom?” I asked. “By my friend, Henrietta, the eagle. She lives here and she doesn't have hands to put everything in place,” Charlie answered. 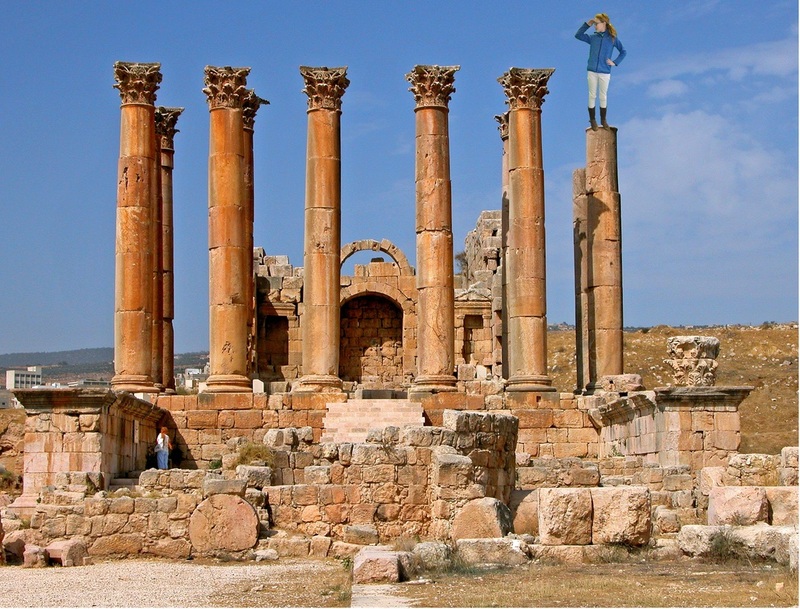 “Did you know that the Temple of Artemis was one of the wonders of the ancient world?” Or, “Did you know that the Temple of Artemis was completely rebuilt three times before its eventual destruction in 401 B.C. ? And this is one of the times.” Some of the facts were actually interesting like: “Did you know the person who originally invented the list of the seven wonders of the ancient world described the Temple of Artemis better that the rest?” But other facts were really boring. I was about to tell him to “Please be quiet” but I refrained because right in front of our eyes was Henrietta and Artemis. As soon as I saw them, I said, “You're really real!” “Yes,” she replied. “But don't let those crazy Greeks know. If they saw me, they would go bezerk!” But, not like they already aren't. We Gods are just a group of regular people who have different interests and like different things. For instance, I love the moon and hunting. We spend most of our time hiding and spying on the Greeks. Oh, Charlie, are you okay after falling on Hades' head?” “That was Hades?” I questioned. “Yep,” she answered. “Yeah, I guess,” said Charlie. “Well, we'd better be going. I wish we could stay. You guys are welcome to explore my temple if you like. I have to go to a G.O.D.S. Meeting. Just so you know, that means 'Group of Diligent Spies,'” Artemis said. “Bye!,” said Charlie and I in unison as they disappeared into the clouds. I ended up exploring Greece a little more including the temple. And if you are dying to know how I got back (I know some of you are like that), I found that Invitation thingy and got back through that just in time for dinner. Hi, my name is Natasha. 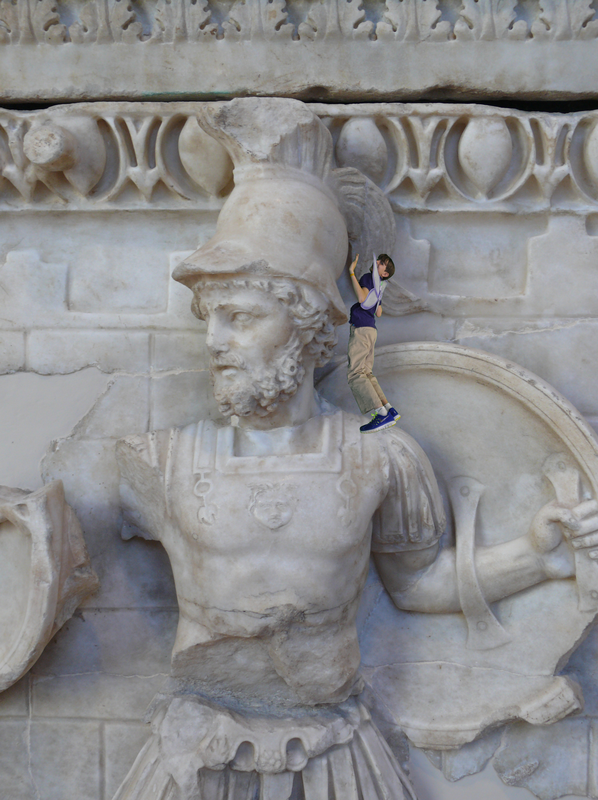 I was learning about the ancient agora of Athens in history class today. When I went home, I did all my homework and before I knew it, it was time for bed. I dropped my toothbrush under my bed so I went under to get it. I saw a portal under my bed. It was so beautiful I just had to touch it. But suddenly, I was being sucked into the beautiful portal like there was no tomorrow. I got transported back in time to the ancient agora of Athens that I had been learning about in class today. Time must have been flying past because they had no clock. I had no idea what the time was and if my parents were worried about me. It was strange because there were no women at the ancient agora. There were only ugly and very loud men who had awfully funny clothes on. I went up to one of these comical looking men and I asked him :" Where are all the women?" and he replied: " At home, where they belong. Why on earth would they be here?" I looked around and saw that I was the only girl there. It was very strange. I asked another man: " Why were all the women at home and what were they doing?" He replied: "The women are at home. That is their duty. They have no right to be here. They are meant to be invisible. Their job is at home where they take care of the family, the slaves, the cooking, and other chores. Why are you here? This is preposterous!" I ran away as fast as I could to get away from him. I ran until the end of the agora and there I napped for a very long time. When I woke up, I was surrounded by beautiful pottery, wool that was so soft on your skin, and many other interesting crafts. The men were haggling over prices. It was the loudest thing I had ever experienced. There were also many different kinds of foods and I must have tried most of them. The food was very simple. It was mostly bread, cheese, and olives. I found out that meat was very rare. I asked the vendor :" Where is the meat? ", to which he replied:" We only eat meat at religious ceremonies. Shouldn't you know that? " I also saw men buying goods for their homes. I was walking around the agora and looking at all the different vendors. One of the vendors was selling miniature statues of the Greek Gods. I saw Zeus, Athena, Demeter, Aphrodite, Poseidon, Apollo, Artemis, Persephone, Hester, Hera, and Hades, just to name a few. They looked so gorgeous. There was not one mistake on them. The vendor must have noticed my amazement at the beauty of these statues. He explained to me : " These statues represent the goal of Greek art. The goal is to have perfect balance, order, be lifelike, and full of action. The Gods have human forms but they are immortal and have incredible power." I quickly realized that the agora was not just a market place but also the center of public life. All the men would come to not only discuss politics and arts but also to just gossip. Philosophers such as Socrates would also come to this public place and question people's beliefs and the gods. Philosophers would also have debates amongst themselves. I met Socrates and he was really the only man who wanted to talk to me. "Know thyself," he told me. When I got to Athens, I did not know what the time period it was. In history class that day I had learned how the agora had been destroyed but had been rebuilt several times. It had been attacked by the Persians in 480 BC and had been restored. It must have cost a bomb! Athens must have used all the tributes that had been given to them by their allies in order to pay for all these costs. It all looked very new so I gathered that I must have been in the 400's BC. On the third day, I finally thought of a plan to get home. My plan was that I went to Socrates' house and I got my toothbrush that I had grabbed before I entered the portal and I dropped it under a bed. I entered Socrates' house and went through the courtyard and found a bedroom. I went under the bed in hope of seeing the magic portal... Three hours later... It was nine PM. I tried my plan, and guess what? The plan worked. I was home and it was exactly the same time. My parents had not even realized that I had been gone. I will always remember this experience and I will never ever forget it because I actually met Socrates, one of the most famous philosophers in the world. now you know the story of how I got transported to the ancient agora of Athens. One day, I was walking down to the lake by my house because I thought I might do some fishing, when I a large shadow covered me and the ground around me. I started to look up to see what made the giant dark spot over the grass, when I was grabbed by the shoulders with something sharp and lifted into the air. “Help, Help!” I yelled. I heard the creature squawk and I knew it was a bird of some kind that had me. I was lifted so high into the air, I guess I passed out. When I woke up, I was hot! The sun was baking down on me and there were a lot of people walking around in the distance. I saw so many large buildings and I thought for a minute that it looked like Ancient Greece! I slowly got to my feet and realized I was wearing a toga! I quickly scanned my surroundings, and saw things that I recognized from history class! How could it be possible? I panicked and started to run. I saw two huge hills, and thought I should go there. It turns out; one of the hills was the Acropolis where the Parthenon was built. I was afraid, but I was curious too. I mean, it’s not every day you get picked up by a giant bird and dropped off in Ancient Athens! I wanted to see the sights. When I got to the Parthenon, I saw the huge statue of Athena that I had read about. As I started around the building, I saw a hang glider lying on the ground. I decided I would give it a try. 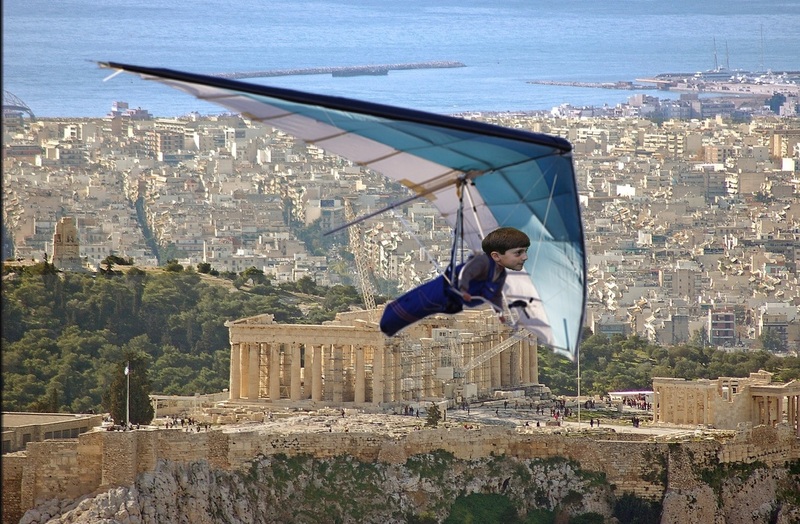 I strapped it on and ran as hard as I could and jumped off of the edge of the Acropolis. I began flying! From high in the air, I saw the busy Agora with people going about their day; I saw the countryside where olives and grapes were grown. I also saw the Academy where boys went to school. They were playing sports. It was great! There was also a big harbor with boats. It was a busy place, too. 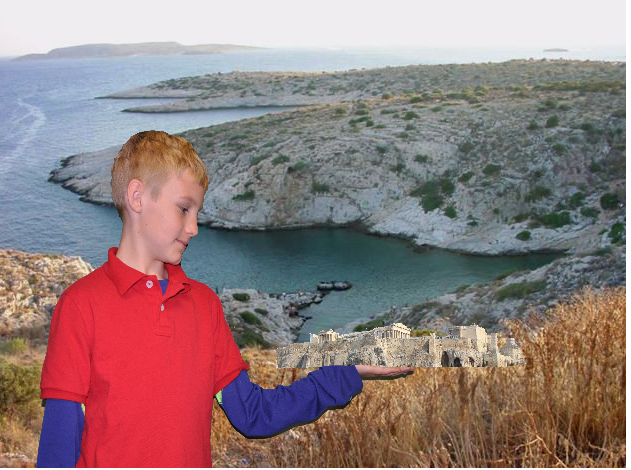 Athens was a big city, and the capital of Greece. It was beautiful! It was so fun and exciting, but suddenly the wind started to blow really hard and I started to lose control of the hang glider. I started to spin really fast in circles. I spun so hard that I must have passed out again! I woke up next to the lake at my house. The dog was licking me in the face. Did I have a dream? I was glad to be home, but Athens was so cool! That night when I took my shower, I noticed scratches on my shoulders. I don’t think a dream caused those! One day I was playing on my ipad at my house. I noticed that the game froze and suddenly I was sucked into it. When I woke up again I was laying down on an uncomfortable rock. When I stood up I realized I was on a huge hill. Everything looked different. I asked the people walking past me where I was. An old man told me that I was on the Acropolis in ancient Greece. I walked up to a strange building. Inside there was a statue made of gold, ivory, and silver. I saw a bunch of people crowded around the statue. Another person told me they were worshiping the statue named Athena. I walked out of the building and heard a bunch of screams. I looked at the city below. There were a bunch of soldiers in amour with swords and spears heading for the Acropolis. Everyone in the city ran up a path way to the Parthenon and started praying. I ran in with them and asked another person what was happening. They said that Athens was under attack. When everyone was done praying they ran out of the building and into the fight. I started praying to then I ran out. The building collapsed behind me. I started glowing. Soon I disappeared. When I woke up I was on my bed with my ipad on the same game. This time the game was starting. Everything was back to normal. When my dad came into my room he said that I wasn’t at home for a while. He asked where I had been. I told him the hole story on Greece. He laughed and walked out of my room. I knew it was true though. On my 7th birthday which was a very sunny day, I woke up and had a special breakfast of pastries, bacon and eggs. Next, I opened up my presents. My favorite present was a gold necklace from Uncle Bob and Aunt Sue. I went to my room to put my presents away. As I looked at my necklace some more, I realized it was a locket. I opened it up and saw pink & blue swirls inside. All of the sudden the swirls filled the room. When they disappeared, I was no longer in my bedroom. I was at the Parthenon in Athens. I was just walking around very scared and saw a huge statue. That statue was of Athena, the goddess of wisdom. There was a sign that read "Do not touch", but I did anyway. Some guards saw me so I ran and they chased after me. While I was running, I noticed a lady was running beside me who looked like Athena. She gave me a strange look, because I was still wearing my pj's. She said, "Come with me to get some normal clothes". She took me to an old lady who makes her clothes. The lady sewed me a beautiful purple and blue dress. Now that I was wearing the dress, I looked like I was from Athens. We decided to walk around the city and Athena told me a lot about her. 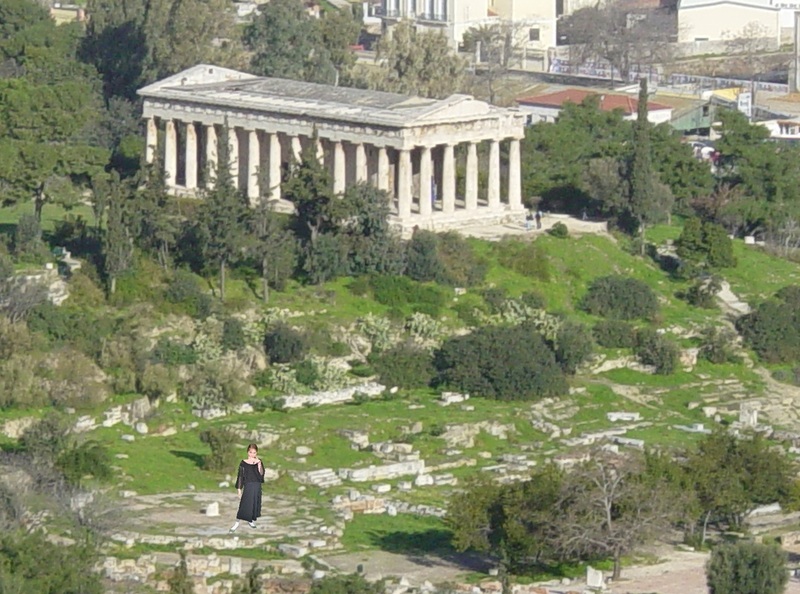 She had her own temple, the Parthenon, which was built in the mid-fifth century BC. It was damaged during a conflict. After I had seen enough of the city, I wanted to go home. I opened up the locket and the pink and blue swirls appeared all around me. When they disappeared, I was back in my home. It's a birthday, I'll always remember. I was riding my bike on a sunny day and I crashed. I rolled down the hill into a stream and when I got out I was in the first Olympics training ground. I was about to get smashed by a huge man. So I did what my instinct was to roll away from him. He hit the ground hard I asked him if he was ok. He punched me. I was back in the stream with my bike then back in Greece. When I got back I was walking to the temple of Zeus. I saw one of the charioteers buying a few swords. They were not ordinary swords. They had no handles, I wondered for a second I remembered the Persians had ware chariots with swords on there wheels. When I got to the temple I told the ref. He said the man’s name was Ion Zambia and he would not cheat. I went to the competition I chose, the race in armor. You race in shining armor. It was a competition in the old Olympics. There were 14 racers each was very skilled. I represented the city Thebes. I had Thebes engraved on my sword and shield. 3 2 1 the race was on and the man from Athens was ahead of me 30 seconds later I was the fastest man on earth! I went to he chariot race to watch. Ion was putting on the swords inside his wheels no one noticed. I told the ref again. He said the same thing. I went to Ion chariot and pulled the sword out. He had been caught. I was watching television peacefully when Robbie came along with a weird look on his face. I got up to see what was wrong and Robbie punched me! I was knocked out cold! When I woke up, I realized that I had been transported to Sparta in 424 BC. 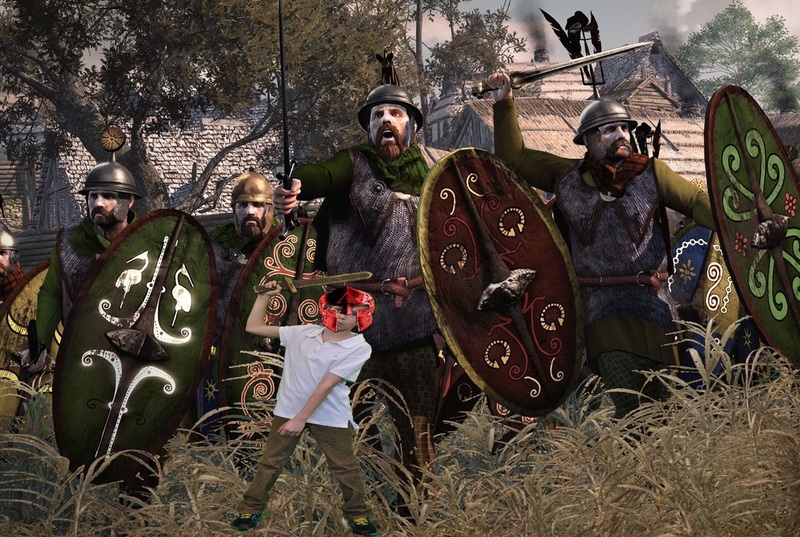 It was a warm, sunny day, and I saw lots of little warriors training for battle. They were training for war with real swords. I discovered that Spartan boys train at age seven and the women are encouraged to produce strong boys. I also learned that Spartans care very little about arts and learning. Instead, they cared about being good warriors and war. When I walked up a tall hill, I saw a war going on right in front of me. It was the Battle of Thermopylae against the Persians. The Spartans ended up losing the battle, but they ended up winning the war. The Spartans were such skilled warriors that Thidipides ran across a twenty-six mile battlefield just to decline their rival Athen’s request for help. The next thing I knew I was struck by an arrow which knocked me out. Luckily it was all a dream. I woke up and was back at home with Robbie laughing at me. It was one hot day when I was at the petting zoo in Virginia with my family. 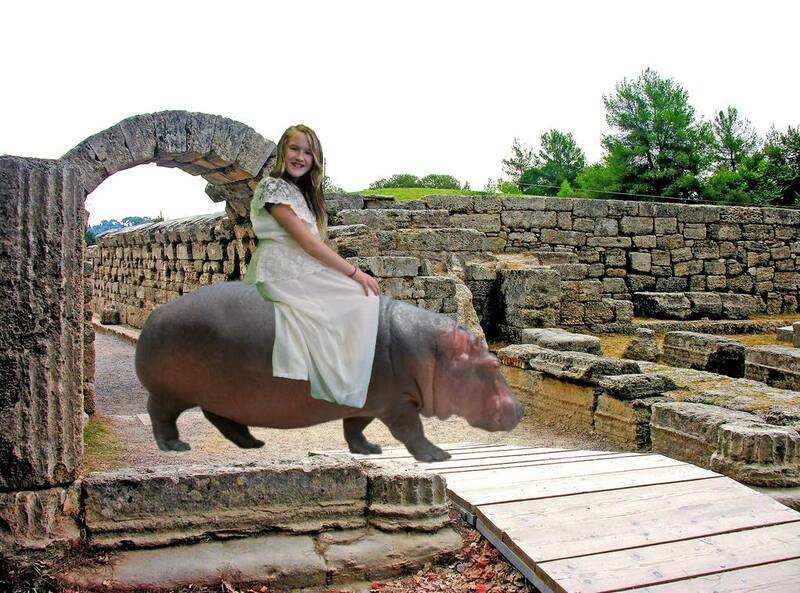 As I was walking down the side-walk, I saw some hippos and asked the lady there if I could ride one. She thought for a moment and said, “go ahead; you look responsible”. Of course I said “thank you” and hopped on the hippo. I said, “go hippo” and off we went. We started to ride when all of a sudden, I was in Olympia! I was shocked, and a man came up behind me, tapped me on the shoulder and said, “Miss Priestess, come. The games are about to begin”. I thought to myself and said, “I’m Jenni, not a priestess”. So, I said, “O.K.” and followed him. When I walked in, I saw a bunch of naked athletes. I tried to run but they shut the gate and sat me in the highest chair. I thought the Olympic games were established in 776 B.C. If this was the first Olympic games, I must have traveled back in time thousands of years through a time portal. I wondered to myself why are there no other women except me here. I said, “Ooh, I remember we learned this in history class. The women were not allowed to go to the Olympics. They had to stay home to take care of the children and the slaves. As I was watching the Olympics, I saw all sorts of games like track, chariot racing, wrestling, and boxing. I looked in the stands and saw people all over the world because the Olympics were the biggest thing back then like concerts are to us today. Then, I said to myself, “ I have to get out of here”. So, I acted like I was going to watch the chariot racers. Then, I hopped in the chariot, whipped the pretty horses and off we went. However; they stopped at a large rock and all of a sudden, I was at the petting zoo again on the hippo. I said, “goodbye hippo; see you later. Thank you.” Finally, I hopped of the hippo and thanked the lady for letting me ride and went home. One day I was in school during History class and I fell asleep. When I woke up, I was in this battle! A crazy, battle with soldiers and battle armor! When I was in the battle, I felt older, stronger and I had battle armor and an iron sword. I fought and fought until I ran out of energy. Then, I decided to hide behind a tree. After a couple of hours, I decided to go back in the battle but it was now over. 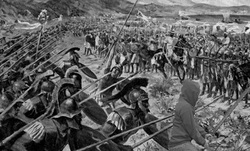 Now, I walked to Greece and I saw some soldiers and I asked them what kind of battle was I in? The soldiers said, "You were in the battle of Marathon of course!" I could not believe it! The famous battle! So, then I left after a couple of days with no sleep. I found a house to sleep in. When I woke up I was back at school studying the battle of marathon. THE END.